What are Best Ways to Keep Track of a Household Budget? There are a number of apps available for both Apple and Android devices that make it easier than ever to track and manage your household budget. One of the most popular budget management apps is Mint, which is designed with a dashboard that features a snapshot of your finances. This app shows you how much money you have in your bank accounts and how much you’re spending every month. Furthermore, it automatically categorizes your expenses so you know exactly how you are spending your money. For example, Mint may help you realize that you are spending far too much on entertainment expenses every month. Seeing this information can help you stay on top of your expenses and make better financial decisions in your everyday life. Other apps, such as Dollarbird or HomeBudget, are ideal for people who aren’t managing their household budget alone. These apps allow multiple users to collaborate on creating and managing a household budget, so you can easily track everyone’s expenses all in one place. 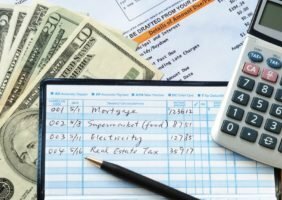 Financial software tools such as Quicken can also simplify the process of creating and managing your household budget. These tools offer many of the same benefits as budget management apps, however Quicken also allows you to plan ahead so you can predict how much money you will have left to spend or save each month. This feature is perfect for anyone who wants to take complete control over their financial future! It’s hard to stay on top of your bills if half of them are sent via email and the other half are sent via snail mail. You could remember to pay the bills that wind up in your inbox, but completely forget about the ones sitting in your mailbox. Make it easier on yourself by adjusting your settings so all of your bills are sent the same way. Implementing this simple strategy will allow you to stay organized so you never run into the problem of forgetting to pay a bill. Most service providers give you the option of automating your payments, which means every month they will automatically deduct the amount they are owed from your bank account. It’s not wise to automate bills that vary every month, since you should take the time to review these statements for accuracy before paying them. But, if you have fixed monthly expenses, use this feature to simplify the process of paying your bills. Once this feature has been activated, you won’t need to remember to pay these bills again. Some people struggle to stay on top of their bills because each of them has a different due date. You may remember to pay the bills that are due at the beginning of the month, but then completely forget about the ones that are due later on. To prevent this problem, contact your service providers and ask them to adjust your due dates. If everything is due at the same time, you can pay all of your bills at once instead of dragging this task out all month long. The only way to improve is to identify your weaknesses, which is why conducting end-of-month reviews is so important. At the end of each month, print out your bank and credit card statements so you can review your spending. If you are using an app or software tool to manage your budget, use the information provided in these tools instead. Next, take a look at how you are spending your money each month. Is it possible to cut your spending in any category? Did you meet the goals you set for yourself at the beginning of the month? Now is the perfect time to see how you did and identify ways to improve over the next month. MarketWatch reported that approximately 49% of adults in the U.S. are concerned, anxious, or fearful about the state of their finances. But, there’s no need to panic every time you open bills or check your bank account balance. Follow these tips so you can ease your concerns and finally take control of your household budget!